United States Republican presidential candidate, 61-year old Rick Perry suffered from temporary amnesia on November 10, 2011. In the middle of a nationally televised debate, he brashly announced a list of three government agencies he would eliminate ... and then was unable to recall the third. In the process, you would think he had committed political hara kiri, but history shows that "political power and mental weakness" is not necessarily an oxymoron. If it does cost him the Republican Party presidential candidacy, the world will have caught a break: susceptibility to amnesia while under pressure at 61 does not augur well for the future of a prospective world leader. And as President of the United States, a capacity for such mental stumbles in he who seeks to be the keeper of the nuclear weapon briefcase, is not conducive to effective international statesmanship. Amnesia is a form of mental disorder but Perry's public display of it was so small - just a brain freeze, really - that is does not register on the psychologist's scale. Still, Rick Perry is just another politician/law-maker in the annals of history for whom We, The People have ultimately paid the price for small or larger mental stumbles. No one knows for sure when King Saul reigned over Israel. Some sources say he was born in Kish in about 1079 BC and died in 1007. Others say his reign occurred in 884 BC. The Bible describes Saul as the first King of Israel, but not as a complement. Saul took it upon himself to be King, while the Hebrew ancients preferred that there be no King but God; and humans could only be national leaders or rulers. Adding the grain of salt required in an attempt to extract history from biblical parables, even part of the legends of King Saul are true, he was more than certainly insane. According to the book of Samuel, he seemed to have a respectable beginning (1 Samuel 9) who did not take rejection personally (1 Samuel 10, 11 and 15). Everyone it seemed had great hopes for his reign. At one point the Bible alludes to Saul's mental illness by referring to "an evil spirit from the Lord" that seem to possess King Saul. After one battle, he had all the citizens of the defeated state killed, including women and children. He apparently committed suicide when his army was about to be defeated by the Philistines in approximately 1007 BC. Lawmaker #1 was Nebuchadnezzar, who lived about 600 BC and who was the King of Babylon. Forensic diagnosis is difficult from historical documents which are themselves a suspect but a diagnosis of bipolar disorder (aka manic depressive), fits Nebuchadnezzar like a glove. This King of Babylon was known to get down on his hands and knees and eat grass as if he was a cow. I wonder why he decided to stop cutting his hair and fingernails - the latter described in historical documents as "bird claws". 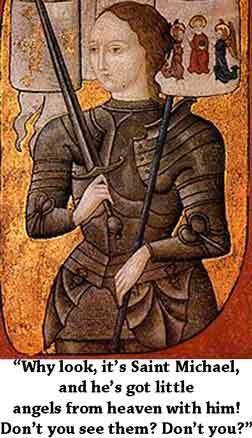 Joan of Arc never really became a lawmaker but she almost restored her country, France, to glory by defeating the marauding English infantry (they would get it back a few years after she was burned at the stake). Joan made no secret of her hallucinations, all rich with religious fervour. She proclaimed that she was surrounded by spirits and angels. A psychiatrist might notice the similarities between these recorded hallucinations and the hallucinations recorded by modern mental health patients. Joan cherished her angels and relied on them to show no fear, including a remarkable drive in the face of great personal danger, to take on the apparently invincible English military force. Later imprisoned and before she was burned at the stake, she said she continued to have visions of Angels but that there were very small in size. Henry VIII was never formally diagnosed with any mental disorder but his history fits perfectly with the sexually transmitted disease of syphilis. Syphilis, once contracted and left untreated, is contagious and if he gave it to his many wives, it would provide a full explanation for the many stillborn children they delivered. "In the late stages of syphilis, the disease may subsequently damage the internal organs, including the brain, nerves, eyes, heart, blood vessels, liver, bones, and joints. Signs and symptoms of the late stage of syphilis include difficulty coordinating muscle movements, paralysis, numbness, gradual blindness, and dementia." Born in 1491, historians often divide Henry VIII's reign into two, which one may now suspect can be properly catalogued as pre-syphilis and post-syphilis. In the first half of his life, he was known to be intelligent and very active physically; svelte and handsome. But by the time he died, he was a morbidly fat tyrant, with a ravenous appetite. He was so fat that they had to build special furniture to move him from room to room. He would awake from sleep screaming of pain from headaches and he would often have fits of uncontrollable rage. A succession of wives is no evidence of mental illness but it is worth noting that he had six of them. Only one child lived a full life, Elizabeth, who died at the age of 70 (Elizabeth I). There is another explanation for his multitude of wives. He may not have known that he had syphilis and that he was infecting each wife in turn, thus ensuring unsuccessful childbirths. He would blame the wives and move onto another one, perhaps never knowing that he was the cause of their childbirth difficulties. The time of his death, his doctors believed him to be completely paralyzed, and then consistent with the diagnosis of syphilis. "He’s on his meds, he’s off his meds." Karzai exhibits incredible mood swings is bigger described by some observers as erratic. Karzai, who has denied these reports, would not be the first bipolar lawmaker . Neil Cole, former Australian Labour Party politician and Michael Costa, former Australian Labour party politician and Treasurer of NSW, both suffered from bipolar disorder.